Colonial Revival. The 2-story, 5-bay gable-roofed office building. Main blocks features a gable-end entrance with a 2-story pedimented portico supported by Ionic columns. Details include modillion cornice, rusticated stone quoins, and plaster belt course. A 4-bay wing faces Rivermont Avenue and features a 1-story, 3-bay shed-roofed porch. Building now serves as office space. The interior has been altered. Alteration in 1927. Converted to J. E. Fauber Funeral Home. 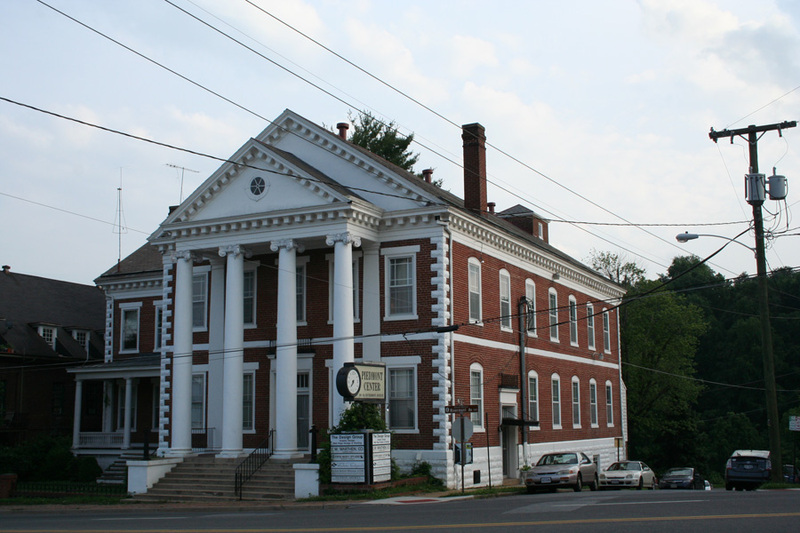 Piedmont Business College opened in Lynchburg around 1888 and offered classes in shorthand and secretarial skills, as well as accounting and bookkeeping. The school moved to new quarters on Rivermont Avenue around 1903. It advertised in the 1913 publication "Here's Lynchburg" as a successful institution, with numerous satisfied graduates. The school apparently closed at this location in the mid 1920s. In 1927 the building was sold to Fauber Mortuary Company, which remodelled the building and added the present two-story portico. Architect for the remodelling was J. Everett Fauber. This property is currently the Piedmont Center.